Home should be a place where people can be safe, enjoy time with their family, and relax. For too many individuals, however, home is a place filled with potential hazards. This can be especially true for apartment dwellers. 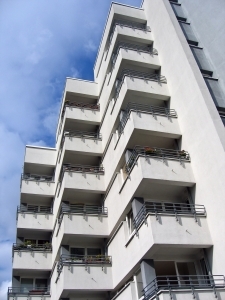 Our San Francisco injury attorney has seen many accidents arising from defects in apartment buildings. In San Francisco’s urban environment, many residents encounter problems with dangerous items that are not promptly fixed by building owners. Many of these potentially dangerous items, from water heaters to windows, are beyond the control of the tenant. Despite the fact that renters often inform their landlords of problems that need to be fixed, these requests often go ignored. Common areas, such as entryways, are another source of trouble. One recent even highlights the dangers often faced by those in their own living space. One of our area’s reality television stars was recently injured in a San Francisco apartment building accident. As MSNBC reported, “The Biggest Loser” contestant Sam Poueu was seriously hurt when he fell off the roof of a four story building at the beginning of September. According to family members, he was attempting to climb down the fire escape after he was locked on the roof of a friend’s apartment. He suffered injuries including damage to his pelvic region, a punctured lung, torn ligaments and a broken leg. The landlord in this case may not have known that the door to the roof had a problem. Without notice that a tenant or guest could be trapped on the roof, the building owner may not have legal responsibility for an injury caused when a visitor trapped on the roof tried to climb down. In another situation, however, where the landlord was aware that tenants had been locked on the roof before, the landlord might be liable. Under the traditional rules of landlord-tenant law, landlords have a duty to ensure that common areas are well-maintained. In a lobby, this means the area must be well lit and doors should be secured with working locks. In a building where tenants can use the roof, users should be able to easily enter and exit the roof and safety devices should be in place to keep individuals from accidentally falling off. In the instance where a problem develops, such as a broken light fixture, the landlord has a reasonable amount of time to remedy the problem. If the problem is not corrected within a reasonable period, the landlord can be liable for any subsequent injuries that are caused by the defect. At the Brod Law Firm, our San Francisco landlord problem attorney has experience dealing with accidents that are the result of landlord neglect. If you or someone you know is injured in an apartment building, please contact us. We can examine the events surrounding the incident and determine if the landlord had a duty that he or she ignored. We can give you advice on the best way to proceed and determine if your situation would be best served with a lawsuit. You do not have to deal with a San Francisco apartment accident alone. We can help.